Kim Curtis (Argan) and Briana Manente (Toinette) in Annapolis Shakespeare Company’s production of Moliere’s ‘The Imaginary Invalid.’ Photo by Joshua McKerrow. Tired of the usual stuffy, arty, lights-out, shut-your-mouth-and-take-it kind of theatre? Looking for a night when everyone can just sit outside with a beer or a bottle of wine and have a few laughs? Do you get a kick out of a show where the actors include you in the action, confide their characters’ secrets, and (ahem) perhaps even flirt a little? 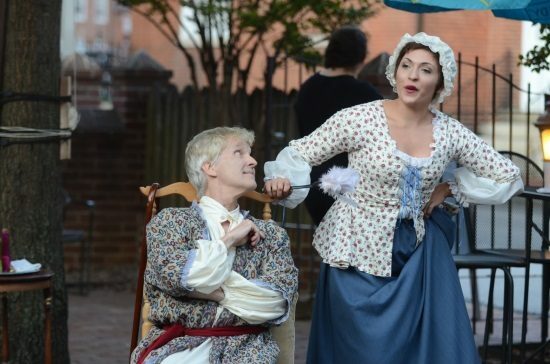 Get thee hence to downtown Annapolis, where the Annapolis Shakespeare Company is cracking up audiences every Tuesday night at the Reynolds Tavern with a truly classic comedy, Molière’s The Imaginary Invalid. It’s running through October 7, folks, there’s really no excuse not to treat yourself! This is the second year of the ASC’s “Comedy in the Courtyard” series, and the choice of The Imaginary Invalid couldn’t be more appropriate or more delightful. Set in the open-air courtyard of the Reynolds Tavern, you’re invited to have a nice meal, sample the micro-brews or pop a cork on the wine of your choice before, during and after the shenanigans. It’s so much fun for the middle of the workweek, it almost feels illegal. Since the action takes place a few centuries before Obamacare, Argan hits upon a unique method to guarantee free health care for life: marry his daughter Angelique into a doctor’s family. Chaos ensues, naturally, because Angelique is already in love with a boy named Cleante; so the young couple plot with Argan’s maidservant to bring the old man to his senses. Among the show’s many highlights is Briana Manente’s lusty, whip-smart Toinette, the servant who knows just how to bend Argan to her will; she also has a brilliant comic turn toward the end of the show masquerading as a quack, and the routine is enhanced immeasurably by sloppy, behind-the-tree costume changes that Manente integrates into the action. 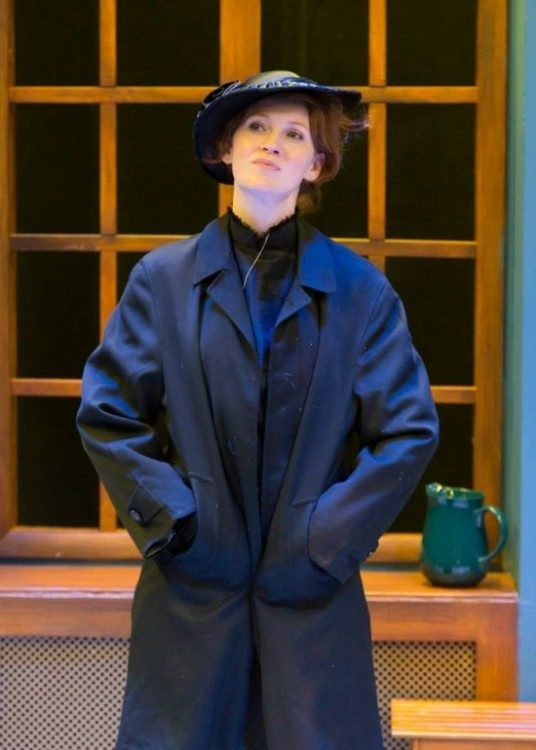 Ashlyn Thompson displays perfect comic timing as Angelique, the young lovebird; and when she teams up with Keegan Cassaday (her Cleante) you get the impression that, even if unmarried, the young couple has a future in vaudeville. As a character actor myself, however, I must direct your attention to what is hands-down the funniest series of characters in the show, all of them played by Zachary Roberts (whose name shows up in the program so often, they might just as well say he does it all). Only a pro can pull off the changes in physicality, voice and walk required, and Roberts can switch at the bat of an eye between a lusty notary, a geeky undergrad (Angelique’s intended; eww …)a pharmacist, etc.—you’ll do a double-take every time he comes on, as you glance at the program and realize yup, it’s him again. Moliere’s comedies have the distinct feel of improvisation, and he stole some of his best routines from an Italian Commedia dell’ Arte troupe, with which he shared a theatre for many years. The Commedia is famous for its stock characters, its bawdy sense of humor and nonsensical plots, and Imaginary Invalid is no exception to this time-honored rule of comedy. Kristin Clippard works from a breezy, hip adaptation of the play by Timothy Mooney, and she has encouraged her cast to make inventive use of the entire courtyard area. The actors weave around and between the tables where we sit, gladly taking it all in. The concept of an intimate performance like this is a winner—seating is limited, so order ahead! 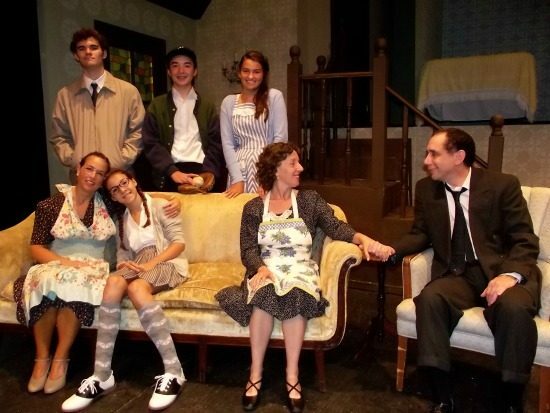 With the curtain time at 7:30 you can safely wait until rush hour is over before you head out the door, and with a carefully edited script, this production of The Imaginary Invalid leaves you plenty of time to get home on a weekday evening. Running Time: 1 hours, 40 minutes with two intermissions. The Imaginary Invalid performs on Tuesday nights thru October 7, 2014 at Reynolds Tavern, 7 Church Circle, Annapolis, Maryland 21401. Tickets can be ordered by calling 410-415-3513 or by clicking here.